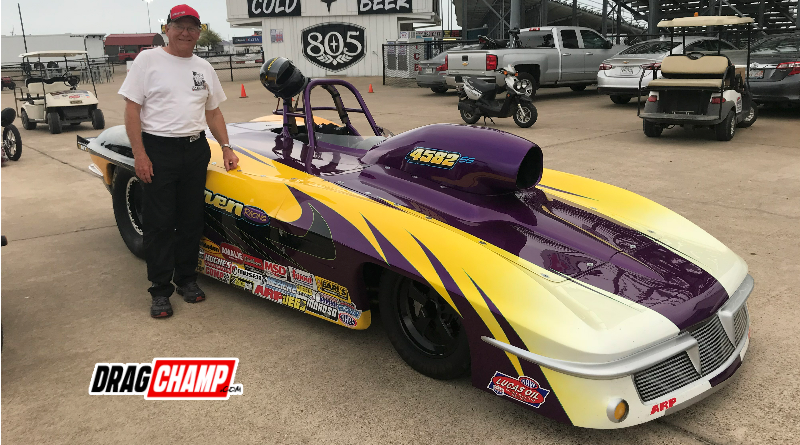 Craig Bourgeois wins twice, David Rampy and Austin Williams make multiple final rounds at the NHRA Division 4 Lucas Oil Series double header at the Texas Motorplex. Craig Bourgeois, Metarie, La., ’05 dragster, A/ND, 6.798, 189.63 def. Brad Plourd, Holly Pond, Ala., ’10 Spitzer, AA/AM, 6.456, 191.24. David Rampy, Piedmont, Ala., ’87 Camaro, GT/LA, 10.321, 113.69 def. Jerry Emmons, Pasadena, Texas, ’05 Cavalier, GT/GA, 10.122, 132.87. Austin Williams, Waxahachie, Texas, ’72 Duster, F/SA, 11.268, 109.96 def. Parker Devore, Blanchard, Okla., ’80 Volare, I/SA, 11.750, 111.11. Bart Nelson, La Porte, Texas, ’15 American, 8.927, 160.21 def. Austin Williams, Waxahachie, Texas, ’19 Miller, 8.910, 163.16. Cole Cummings, Hammond, La., ’66 Chevy II, 9.906, 143.28 def. Travis Salter, Baytown, Texas, ’67 Camaro, 9.897, 152.45. John Leibham, Tomball, Texas, ’68 Camaro, 10.909, 141.40 def. Jim Burrell, Claude, Texas, ’70 Torino, 10.935, 150.61. Cole Prejean, Saint Amant, La., ’06 GTO, 7.230, 183.62 def. Tom Patterson, Lorette, Manit., ’94 Camaro, 7.260, 197.88. Aaron Stanfield, Bossier, La., ’17 Miller, 6.195, 222.22 def. Rusty Baxter, Beckville, Texas, ’13 Racecraft, 6.210, 209.07. Brenda Kay, Humble, Texas, ’92 SUZ, 8.851, 144.66 def. Dean LeBlanc, New Iberia, La., ’10 KAW, foul. Craig Bourgeois, Metarie, La., ’05 dragster, A/ND, 6.829, 185.97 def. David Rampy, Piedmont, Ala., ’32 Bantam, A/EA, 7.229, 171.62. Elisha Boyd, Sumrall, Miss., ’05 Sunfire, GT/EA, 9.491, 135.91 def. Mike Town, Paola, Kan., ’84 Regal, GT/OA, 10.654, 122.20. Jacob Pitt, Mansfield, Texas, ’69 Barracuda, C/SA, 10.661, 108.78 def. Mike Trumble, Pasadena, Texas, ’71 Chevelle, D/SA, foul. Mike Green, Moore, Okla., ’07 Monden, 8.866, 172.17 def. Craig Anderson, Waxahachie, Texas, ’14 American, foul. Roger Warren, Jacksonville, Texas, ’18 Spitzer, 10.027, 146.43 def. Ken Griffiths, Eden Prairie, Minn., ’10 Corvette, 10.303, 158.09. Don Snow, Hawkins, Texas, ’65 Corvette, 10.885, 145.41 def. Zachary Martinez, Pasadena, Texas, ’70 Vega, foul. Mario Boesch, Ponchatoula, La., ’17 Miller, 6.154, 210.70 def. Ross Laris, Raceland, La., ’18 Racecraft, 6.201, 215.58. Glenn Wright, Odessa, Texas, ’12 Camaro SS, 6.613, 211.79 def. Craig Liles, Artesia, N.M., ’13 Camaro SS, foul. Beau Droxler, Ellis, Kan., ’80 Kawasaki, 8.431, 143.90 def. Ricky Kay, Humble, Texas, ’92 SUZ, 9.003, 142.79. For more NHRA sportsman drag race results, click here.